As corporate chef for the Certified Angus Beef ® brand, Michael Ollier showcases beef recipes and cooking tips on radio and television shows. Special events and cooking demonstrations take him across the country as well to teach audiences that flavorful food begins with fresh, high-quality ingredients. Favorite style of Burger: Kissed with flame on a charcoal grill. Favorite Childhood Burger: A backyard burger from my Grandpa Doerger. Grandpa owned a butcher shop in Cincinnati after World War II. He built a brick wood-fire grill in his backyard. Family gatherings were plenty, and so were the patties that graced the grill. Burger that haunts your dreams at night: Dry, soul-less burgers; burgers with disproportionately large buns; burgers where toppings are more important than the beef. What is the one Burger you’ve always wanted to try but still have not: Daniel Boulud’s iconic burger at db Bistro stuffed with short rib and foie gras. 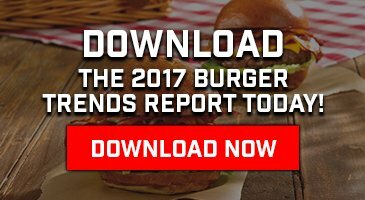 The secret to making a great Burger: Start with quality – then get out of its way! Under no circumstances whatsoever, what should NEVER be put on a Burger: I’m all for culinary creativity and comfort food, but putting mac and cheese on a burger is neither creative nor comforting. It’s a starch-on-starch crime spawned, I suspect, from late-night drunkenness. If you could have a Burger with anyone alive, or dead, fictional or real, who would it be and where would you take them: I would love to relive that backyard burger with Grandpa, joined by his great grandsons – my two boys, Theo and Nico. It’d be hand-ground chuck from Doerger’s Meats (now long gone), charred over the pit, chased with a brat with kraut while sipping on Christian Moerlein. Please use this space to talk about or plug anything else you want: CertifiedAngusBeef.com is a great place to learn more about beef cuts, find recipes, watch instructional cooking videos and read more about the Certified Angus Beef ® brand’s unique connection with family farmers and ranchers. Check out the Certified Angus Beef ® brand’s blog GoRare.com for even more beefy stories and recipes, and follow the brand on Twitter, Facebook, Pinterest, Instagram and Periscope. And, follow me (@tallowbethyname) on Instagram for a look behind the scenes of my beef-centric world. If you love Burgers and also love films, you’re going to want to attend the NYC Food Film Festival this year. And we’ll get you 10% off your tickets to attend. Have you ever been watching a TV show about food and wished you were eating the food that was on the screen? You can do that at The Food Film Festival! Schweid & Sons is proud to sponsor the opening night of the Festival entitled “Tender: Stores of Love and Meat.” During the event there will be screening a film that festival director George Motz has produced and directed about the science behind what makes the very best Burger by paying a visit to the Certified Angus Beef headquarters. The film features behind the scenes of what happens at the Certified Angus Beef® education and culinary center featuring Dr. Phil Bass. Phil works with Chef Michael to create the Very Best Burger using Certified Angus Beef®. The Burger that is featured in the film will be served to you at the party! The outstanding efforts of @tallowbethyname is about to pay off @certifiedangusbeef education and culinary center. We ground this patty ourselves using chuck and brisket. It’s topped with caramelized onion beef bacon jam which we also made, some arugula and because it’s #NationalCheeseburgerDay, some melted Gorgonzola. It’s all for a @motzburger project. Use code “VeryBestBurger” to get 10% off tickets to the event! Click here to get yours now.